Split PDF on HP Scanner (A-PDF Scan and Split) is a great solution for those who want to split scanned PDF pages with facing pages into separate PDF files. This PDF scan and split software allows you to split the PDF file using printed barcode or blank page as split tag. This all-in-one utility combines Scan and Split functions and enables you to scan a large volume of paper documents once you connect your computer with a scanner such as HP, Epson or Sanner. And then you can split the scanned pages into separate PDF documents. Split a large volume of scanned PDF documents. Split scanned PDF file based on printed barcode or blank page. Split scanned PDF file by every N pages. Work with HP, Epson and Sanner scanners. 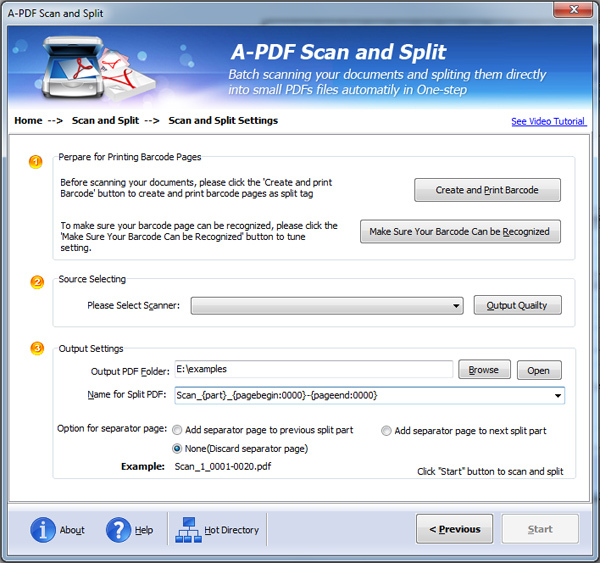 Split PDF on HP Scanner can help you split scanned PDF pages by barcode on HP, Epson or Sanner scanner. It is very easy to operate and you can finish the job very quickly. After you start this program, you can then select a split mode. And when you select "Scan and Split" mode, click "Next" and in the next interface, you will see THREE optional Split methods, including Printed Barcode Page as Split Tag, Blank Page as Split Tag and Split by every N Pages. Then if you select the first one, in the Barcode Split interface, you can create and print barcode for splitting the scanned PDF document. Split PDF on HP Scanner allows you to print many different types of barcode as follows: EAN 13, UPC-A and 2/5 digit extensions; Code 128 and UCC/EAN-128 encoding; Code 39; Code 93; EAN 8; UPC-E; UPC 2/5 digit extensions; Interleaved 2 of 5; Codebar; Patch codes. To help you better archive files, this PDF scan and split utility provides you with different name patterns with Macro settings. You can name the split PDFs in well-organized structure.